In September 2014, GPTCHB received a Comprehensive Approach to Good Health and Wellness in Indian Country awards in the amount of $650,000 per year for five years. These awards are part of a U.S. Department of Health and Human Services (HHS) initiative to support public health efforts to reduce chronic diseases, promote healthier lifestyles, reduce health disparities and control health care spending. GPTCHB’s Great Plains Good Health & Wellness (GPGHW) Program will fund tribal support and assistance projects to help reduce the significantly-high rates of heart disease, type 2 diabetes and stroke for American Indians living in the Great Plains region. The GPGHW Program will provide 10 sub-awards GPTCHB member tribes that develop or have existing PSE change strategies. The sub-awards will range in amounts from $15,000 to $30,000. Tribal programs, partners, and the GPGHW Program will collaborate to develop and implement culturally-appropriate, evidence-based Policy, System, and Environmental change approaches in tribal program activities. These approaches may include implementing culturally-relevant health curriculum, reduced commercial tobacco use, increasing access to traditional and healthy foods, and increased opportunities for physical activity. The GPGHW Program will provide Great Plains tribes with financial and technical support for community health assessments, tribal capacity, epidemiological support, partnership development, policy development, evaluation, identification of possible community linkages, and PSE trainings. Funding for the Great Plains Good Health & Wellness Program is specifically provided through a cooperative agreement from the CDC’s National Center for Chronic Disease Prevention and Health Promotion (NCCDPHP). 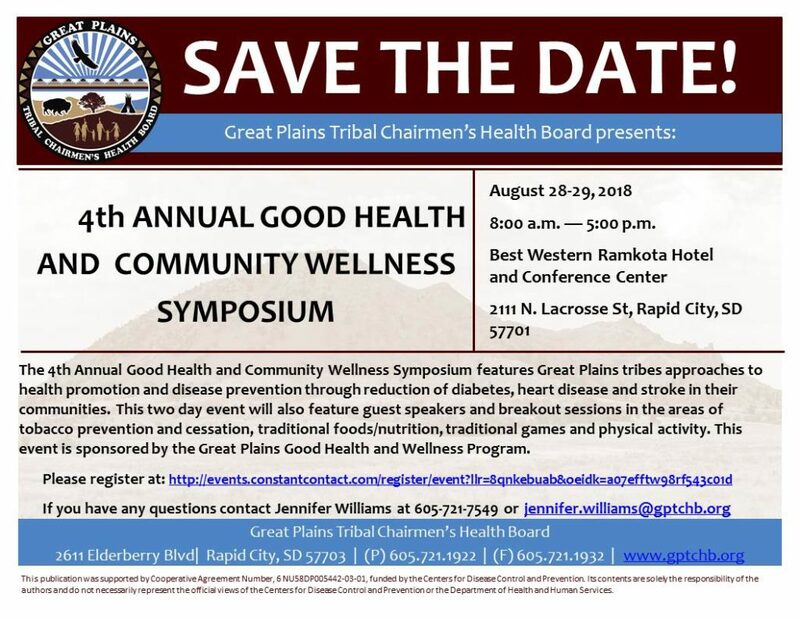 The Good Health and Community Wellness Symposium will showcase the tremendous work our tribal partners are doing to promote health and reduce the risk of diabetes, heart disease and stroke in their communities. This event will feature guest speakers and training opportunities in the areas of tobacco prevention and cessation, community gardens, traditional foods, and physical activity. #FeedYourDNA is an ongoing social media campaign created by GPGHW to engage tribal communities through various social media platforms such as Facebook, Twitter, Instagram, or Snapchat. The purpose of this social media campaign is for people to showcase their healthy behaviors to encourage others to make healthier choices.